Hot on the heels of an extremely successful pinot noir event last week, the fourth in a series of Finger Lakes-themed Taste Live events will take place next week on Wednesday, on April 14 at 8 p.m. ET. I'll be moderating again on behalf of Finger Lakes Wine Country (FLWC). Riesling gets all of the attention in the Finger Lakes, but it's far from the only aromatic white that excels in the region. This promises to be yet another interesting, maybe even surprising, tasting for people who haven't tasted Finger Lakes Gewurztraminer before. Want to join the fun? You can buy this month's TasteLive pack and join us on Twitter next week. Use the #FLXwine hashtag. Six years ago today, I launched this website without any idea that it'd grow and evolve into what it is today. What started as a way for me to share -- with friends and family -- what Nena and I were cooking at home and tasting in Long Island wine country has become a bit of an obsession for me and my merry band of fellow New York wine enthusiasts. Six years. I think that puts me amongst the "old timers" of wine blogging but as I pause today to look back, I also want to announce a bit about the future of the site. First, you may have noticed a few changes here on the site over the last week or so. You're not crazy and you're not in the wrong place. we've re-branded the site as the New York Cork Report with a new logo and color palette. This change has been a long time coming and I'm happy to have my first name out of the site's name. It's long overdue really. I'd like to thank PJ Sedgwick, the designer behind the new logo who has dealt with my many whims and terrible art direction along the way. Inexplicably, she has agreed to join the team as our Creative Director too. She also fills our vegan quota at the one and only permitted on staff. The new logo and face lift are just the first of many changes that are coming, though. We've already expanded to cover wine (and beer) made throughout the state. This year, we hope to write even more about the lesser-known regions. Soon, we will so be adding information and stories about New York-made spirits to round out our beverage coverage. I've also been speaking with several food writers about providing us with stories about those that grow, raise and make great food in New York. Searchable Wine Review Database. Every New York wine reviewed over the last 6 years will be migrated into this and be easily searchable by region, type, variety, etc. Comprehensive Winery Listings and Interactive Maps. Best of all, we think we can keep these up to date, unlike many that are already published out on the Internet. User Ratings for Registered Users. Anyone who registers as a member of the site will be able to rate wines, tasting room experiences, etc. Events Calendar. The hope is that individual wineries that sign up for access will be able t upload their own events for NYCR readers to see. Tourism Information. Our editors and contributors will be tasked with finding the hotels, B&Bs, restaurants and retailers that support local wines the best. They will get the NYCR "seal of approval" and be listed on the site. Vintage Charts. We've already started talking with veteran growers and winemakers (and tasting older wines when possible) to start building vintage charts for Long Island and the Finger Lakes regions. 100-point Rating Scale. We're moving away from the 5-star system we employ now and will move to the 100-point scale. Despite its inherent shortcomings, it can be a valuable tool for consumers, so we're going to try it. Is there something you want to see us do more or less of? We want this site to be better for you, our readers, so let us know in the comments. In the meantime, thank you to all those who have read and contributed to the site over these 6 years. It's been a lot of fun and it's going to be even more fun going forward. It still needs a title, but the hardest part is now over. My posts for the Cork Report have been a bit less frequent than I'd prefer over the past month, and I wanted to explain why that is. I've been in the final stages of writing a book and it has monopolized my time. My publisher set a manuscript deadline of March 15. I'll submit it several days before that date. On Saturday I wrote the final words. This week I'm making final edits. Soon I'll be liberated, able to concentrate more time on the Cork Report, and we have big plans. For those who are not aware of the book, it's not exactly a wine book. I wrote the book to tell the story of Finger Lakes winemakers who have come from around the world -- and around the state, and country -- to make a life here. Why the Finger Lakes? 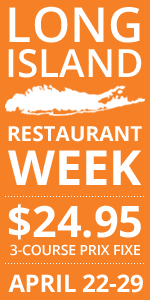 Why not Germany, or Tuscany, or Provence, or Australia, or Napa? What events in their lives pushed them in this direction? How have they overcome tragedy and adversity? Most importantly, how do their stories weave together to foreshadow the future of this wine region? The cynical take on blogs and non-mainstream wine writing is that no one takes time to research anymore; no one travels and interviews and listens. No one investigates. I've tried to blow up those notions, and it's taken almost two years to create this book. Countless people have allowed me inside their homes and invited me to witness watershed moments in their lives. I am grateful. This will not be a wine guide. I would love to tell the story of every person in this fascinating industry, but of course that's not possible. Instead, I looked for common themes and compelling backgrounds. In the months to come we'll attempt not to deluge our readers with book news. However, we're going to have fun with it. Pre-ordering will commence later this year, with a tentative release set for roughly one year from now. The publisher, the great folks at Sterling, will carve it up in editing -- probably reduce me to tears while I beg futilely, "Don't cut that!" -- and they'll decide on a title and cover art. We've already shot video for a book trailer. Yes, we're going to create a trailer for the book much like you would see for a movie. Check out the photo of Fred and Maressa Merwarth of Hermann J. Wiemer, taken by my wife on the day we shot part of the trailer. We'll also be creating a book website that will offer all kinds of details. This isn't an acknowledgements page, so I'll stop now, but thanks for your patience and thanks to Lenn and the NYCR staff for their support with the book. Oh, and there's still time: Do you like the proposed title? Current iteration is "The Fingerprints of Wine: Journeys With the World's Next Great Winemakers." Thoughts? I just caught wind of this via Twitter this afternoon, but it appears that LENNDEVOURS/New York Cork Report has been named as a finalist in Saveur's 1st Annual best Food Blog Awards in the "Wine Blogs" category. All any of us here at the NYCR hope to do is share New York wines and the the people, the places and the stories behind them with you on an almost-daily basis. That we occasionally receive recognition for our efforts is just amazing. Looking at the other finalists, it's a great group that only scratches the surface of the blogs I like best -- and it's an honor just to be nominated. I'm also proud to call many of the publishers friends who I've known for years. So thank you to Saveur, the only food magazine that I subscribe to actually, for the nomination and thank you to all of our readers for being so supportive over the years. If you'd like to vote for us and for your favorites in all of the other categories, head on over to the awards site now. In the meantime, we'll continue with our regularly scheduled programming, bringing you the New York wine news, commentary and reviews you're looking for. In a chic western New York wine bar called Sapore, on a quiet Sunday afternoon, a group of colleagues and competitors did something they had never done before. They poured one another's wines in an introduction to the New York Cork Report and an effort to promote the Chautauqua-Lake Erie wine trail. Producers chose to feature only white and dessert wines for this tasting, and while these wines represented the best of this wine region, they're not showing the same quality that consumers can find in the Finger Lakes and Long Island. But for now, they don't have to. More than anything, this region needs to demonstrate consistency and a baseline of quality to tourists, local wine enthusiasts, and curious writers. The tasting showed that the early drumbeat of quality is getting louder, though it's not without a few off notes. "We have our eyes wide open when it comes to what we should be growing and what grapes will produce the best quality," said Jennifer Johnson of Johnson Estate, the oldest regional commercial winery and the clear leader in quality. That search for the best regional viticultural fit should be the top priority for any emerging wine region. Growers can waste immeasurable resources on attempting to ripen cabernet sauvignon, but they're dreaming a nearly impossible dream. A wine region's awakening coincides with the discovery of its most suitable grape varieties. Here in the rolling land that lies not far from Lake Erie, some growers still struggle with warm-climate grapes - but more are ripping out those vines in favor of a range of more suitable options. And yet of the 30,000 acres under vine in this region, roughly 28,000 are planted to Concord and Niagara. The locals jokingly wonder aloud what old Mr. Welch would think about the rising tide of vinifera and hybrids. Winery owners say that vinifera and hybrids can thrive here - but they must be cool-climate grapes, like pinot grigio and traminette, Chancellor and Vidal Blanc. But they also stand by the wide appeal of Concord grapes and Concord wines. It's a thriving variety, and seeking to eliminate it would be a serious mistake. "Look outside," said Fred Johnson of Johnson Estate, pointing to the snowbanks lining the Westfield street. "This is Germany, not France." The white wine tasting revealed some surprising potential - as well as some puzzling decisions. To wit: Why did one winery submit a chardonnay that wasn't simply oaky; it was like an abusive relationship where the chardonnay refuses to leave the oak that's causing the problem? And why submit a riesling that is either heavily reductive or clearly cut with some portion of native grapes? (Both, perhaps). But there were some pleasant wines and some wines that show an opportunity for the region. We selected three white wines to take with us to our January 23 New York Cork Report Wines of 2009 tasting. We also selected the 2009 Chautauqua-Lake Erie dessert wine of the year. (That's because, of four dessert wines submitted, one was a clear standout with no reasonable competition). Here are the finalists for wine of the year from this region. Thanks to Sapore in Westfield, a classy wine bar that hosted the tasting. It's spots like Sapore that fit perfectly into the fabric of an emerging wine region and help elevate its status. This was the revelation of the tasting, a white wine that threatens to become cloyingly sweet before a current of acidity emerges in the finish and amps up the flavors. All of this in a Vidal Blanc, most commonly used for dessert wine. "We think it's versatile," winemaker Jeff Murphy told me. "We're not afraid to see what it can do beyond an ice wine, and we're happy with what it's shown." Evokes the straightforward northern Italian pinot grigios. Crisp, showing a nice aromatic profile that carries through to the palate. Went nicely with lunch. I asked Liberty Vineyards owner Gary Burmaster about the potential of this grape in the region. "We think it has a place," he replied. "We think dry whites like pinot grigio are doing very well." He didn't go into depth about the specifics of this grape and why it might stand out, but this wasn't the only pinot grigio in the tasting, and clearly other growers are excited about it. The other Rieslings in this tasting showed a processed corn character, evoking a range of candy flavors from Lik-m-Aid to Now And Later to Bazooka Joe gum. This Riesling brought a nice varietal character, led by waves of grapefruit. The strong aromatics made it even more appealing. Taken down a notch because not all of the fruit is from Chautauqua-Erie. Winemakers in this region also speak optimistically of Traminette, and Johnson Estate produces a seriously aromatic version that indicates their optimism is warranted. Slightly hot, this wine brings a complex melange that includes apricot, honey, and maple candy. It's more lithe in the mouth than I expected, with a kiss of butterscotch to round it off. Well done. As we prepare to move to a new Web platform and site in 2010, the New York Cork Report is seemingly ramping up its coverage of New York wine. As of today, we again have a correspondent based in New York City, Andy Freedman. NYC foodies already know Andy (or should) as half of the husband-and-wife team behind the prolific site Wined & Dined. Andy has lived in New York City since 2004. A corporate attorney-by-day and avid eater, drinker and food blogger by night, Andy fits right in with the other obsessed food-and-wine geeks at the NYCR. Andy is passionate about all things food, wine and craft beer. A self-proclaimed “hop head”, he has been exploring the world of sour beers of late. In October 2008, Andy and his wife Jill launched Wined & Dined, to chronicle their eating and drinking exploits throughout NYC and surrounding areas. Andy enjoys grilling on his terrace, watching sports, traveling to wine regions in the U.S. and abroad and spontaneously wandering the streets of NYC in search of good food, drink and fun. Andy and his Jill are frequent visitors to Long Island’s wine region and have also visited several wineries in the Finger Lakes and Hudson Valley. Abroad, they have visited Bordeaux and the Douro Valley wine region of Portugal and hope to make trips to Chile and Argentina soon. For the NYCR, Andy will be covering NYC-based urban wineries and events. 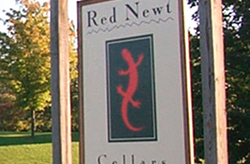 Red Cat winning will come as no surprise to anyone that knows anything about the New York wine world. It's the state's best selling wine and has a legion of devout fans. Those fans were no doubt called to action during this voting process. With 52% of the total vote, it won by a landslide. The Finger Lakes runner up was Hermann J Wiemer 2007 Dry Riesling, with 18%. Shinn Estate's cabernet franc, a big hit at TasteCamp EAST 2009, also won in a landslide, with 52% of the vote with Paumanok Vineyards 2008 Chenin Blanc garnering 17% of the vote. Congratulations to the winners and I'd like to thank all of the readers for their votes. This was a fun inaugural Readers' Choice process. We'll refine it for next year and do it again! I'm excited to announce today that, starting with our January selections, I'll be partnering with BacchusWineOnline.com for The New York Cork Club, the one-of-a-kind wine club featuring wines that I hand-pick every month. Before telling you a bit about the new partnership, I'd like to thank Greene Grape, a great little wine shop in Brooklyn for all of their help and support to this point with the NYCC. But, as a smaller wine shop not necessarily focused on New York wines, Greene Grape was no longer the perfect fit for the club. Bacchus however, is the absolute 'perfect storm' of a wine shop for the New York Cork Club. 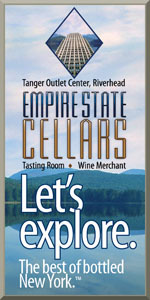 They have an extensive and always-growing selection of New York wines already. It's a clear focus for the shop going forward too, which is easy for me to get excited about. They are also a larger shop, which means more room to stock wines and stronger buying power in the market. Those alone would be attributes in a partnership like this, but add the fact that Bacchus is active in social media, including Twitter and TasteLive, and it truly is the perfect wine shop for me to partner with on the club. If you'd like some background on the club, I'd encourage you to visit the NYCC page. You can also see many of our previous selections listed here. And, if you'd like to sign up -- it does make a perfect holiday gift -- visit our new sign-up page. It's a big, fun day here at the New York Cork Report. Today we announce the finalists in our New York Cork Report 2009 Wines of the Year project. Each of these finalists was hand-picked by our regional editors from the hundreds of wines each has tasted throughout the year. These finalists will be tasted blind by our editors, first within regional-style flights to determine regional Wines of the Year (by simple majority vote), and then against other regional winners for possible New York Wine of the Year status. "New York Wine of the Year" will only be awarded if there is a unanimous choice. You'll note that two regions, the Hudson River Region and Chautauqua-Lake Erie, aren't on this list. Chautauqua-Lake Erie will not be represented this year because we simply don't have enough experience with those wines to feel comfortable choosing finalists. 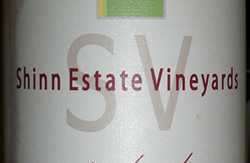 We will be adding Hudson Valley wines -- 3 whites and 3 reds -- to the list later this week. The blind tasting will take place on December 30 at Heart & Hands Wine Company in Union Springs, NY on Cayuga Lake, a central location for the editors to meet. Because Heart & Hands is also a finalist in the Finger Lakes - Red Wines category, owners Tom and Susan Higgins will not be permitted in the room during that flight. The winners will be announced sometime during the first week of January, though they will likely leak out via Twitter not long after the tasting. Look for a post tomorrow about our "2009 Readers Choice" award kick-off as well! Note: There are 6 white wine finalists from the Finger Lakes and 6 red wine finalists from Long Island because the editors wanted to recognize an added wine. We also did not include any sparkling wine from the Niagara Escarpment region because there aren't enough producers. Today I'm proud to announce that, for the first time in this blog's existence, its editors will be naming the New York Cork Report 2009 Wines of the Year on January 11, 2010. Over the course of 2009, the three regional editors for this site -- myself, Bryan and Evan -- tasted hundreds of New York wines from our respective beats. That's the pool from which we're pulling from. We don't pretend that we've tasted every single New York wine released in the 2009 calendar year (which is required to be eligible) but we've tasted more than perhaps any other publication. We know that employing such broad categories -- particularly reds and whites -- has its limitations, but we're going to keep them that way for this year. Depending on how everything goes, we'll revisit it for 2010. With input from our regional correspondents, the editors will name the finalists from each region (with me choosing some wines from the Hudson River Valley AVA as well) here on the site on Tuesday, December 1. Some time in late December (we're still working out the details) the editors will get together for a blind tasting of each flight to pick, by simple vote, "Best of 2009" for each region. Then, the winners of each will be re-tasted for potential "Best of New York," which will only be awarded if the vote is unanimous. This is entirely subjective, non-scientific, and to some degree it goes against our nature. While we score wines that are reviews at NYCR, we are not fixated on scores or ratings. The notion of a wine being "better" or "best" is certainly nebulous, and we recognize that. This project is designed, then, for two main reasons: first, as subjective as this can be, we'll shine a light on what we perceive as the very best wines of the year. And second, it's a lot of fun to highlight some tremendous wines. So we take it just seriously enough for all of us to be very excited. And trust me, choosing the wines has been an extremely difficult process. You'll be hearing more about this effort very soon. Keep an eye out for the finalists on December 1. We'll also be holding a "Reader's Choice" portion the New York Cork Club 2009 Wines of the Year. Nominations start on December 1, so think about YOUR favorite New York wines of the year. Long-time readers of this blog will remember the days when there was one lone voice represented here -- mine. When this blog was founded over 5 years ago, that was the intent, the goal really -- somewhere for me to share my passion for wine, particularly New York wine. What once was a solo performance has become a bit of a chorus with new voices bringing texture and layers to my coverage of New York wines. LENNDEVOURS has evolved and grown to become the premier source for real, unbiased news, commentary and reviews of New York wines. That evolution continues today. I'm happy and excited to announce that Evan Dawson, who has attacked the Finger Lakes beat for LENNDEVOURS with intrepid energy and vigor over the past several months has agreed to expand his role. Effective immediately, he will assume the role of Finger Lakes Editor for LENNDEVOURS.com. Evan has more than earned it with the great video and writing he's been contributing over the last several months. There are more announcements coming, but I'll give you a hint for one of them -- visit NewYorkCorkReport.com. For now, let's re-welcome Evan. He never left, but I think we're going to see even more top-notch coverage from the Finger Lakes. I was disappointed to hear early this week that, as a result of major spending cuts at Stony Brook University, the Center for Wine, Food, and Culture will become inactive at the end of the current semester. Louisa Thomas Hargrave, the founding mother of Long Island wine, will also obviously no longer serve as the program's director. The Center started in 2004, with a state grant via State Senator Ken LaValle. And, from the fall of 2007 to now, they have offer 40 separate wine tasting classes, including the first Wine and Spirits Education Trust accredited courses on Long Island). They also hosted three international conferences. Louisa has encouraged the university to keep the website up in the hopes that, down the road, the program can be re-started. This is a loss for the Long Island wine world, and it certainly leaves a void that is unlikely to be filled in the near term. I emailed with Louisa a bit and when I asked her what her plans are, she told me simply "I will continue writing. I'm looking forward to planting my vegetable and enjoying life on the East End." As you can see, the list of channel owners is impressive with publications like Stephen Tanzer's International Wine Cellar, Lyle Fass of Rockss and Fruit, John Gillman's View From the Cellar, and of course everyone's favorite wine vlogger, Gary Vaynerchuk from Wine Library TV. Best of all, the fine folks at CellarTracker didn't even ask me to join the 100-point scoring wave. My 5-star system remains and is what CT users will see with my reviews. You can also see all of my reviews and ratings on a single page, if you're interested. New reviews will be added every month or so.